2017 Top Shop Finalist: Waukegan Tire & Supply Co. 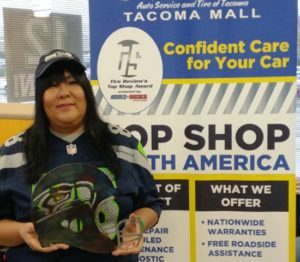 Courtesy Auto and Tire of Tacoma. 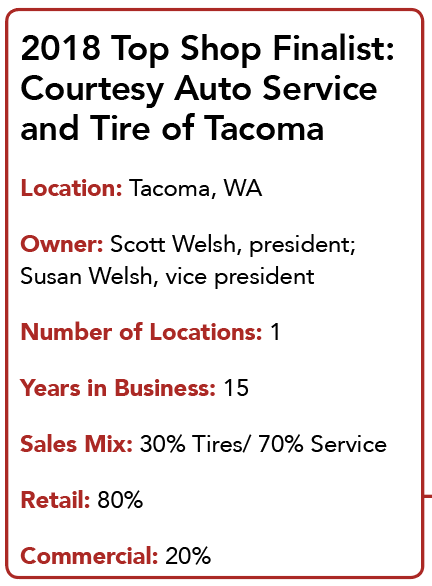 Courtesy Auto Service and Tire of Tacoma is an operation that acts with precision and a clear vision. Every customer interaction, every sale, every business decision is taken with an outcome in mind – bringing in and keeping the ideal customer. This is a store that knows what it wants to be and acts decisively to make vision a reality. That vision comes right from the top. Owners Scott and Susan Welsh understand their market, their ideal customer. They unflinchingly pursue a differentiation strategy that aims to earn and keep the kind of customer that wants their automotive problems to be diagnosed, explained and solved in a way that respects the customer’s desire to understand all that goes into the solution for their vehicle concerns. Courtesy, a 2015 Top Shop finalist, is no stranger to running a great shop, but if they wanted to see the other end of the service spectrum, all they had to do was look out the front door. Until recently, the shop shared a parking lot with a competitor from a tire and service shop that was part of a large national chain. It wasn’t locally owned and emphasized price over customer experience. Because the two shops catered to such a vastly different segment of the market, they weren’t really much competition. In fact, they may even have helped to drive new customers across the lot and into Courtesy. That attitude doesn’t stop with a friendly greeting. Communication can be as powerful as any tool in the toolbox, and Scott and his crew understand that creating an open dialogue can help improve the buying process and even make service more efficient. After all, the customer drives their vehicle every day. They understand better than anyone if something’s not working as it should. It also has the added benefit of showing customers that the shop shared their concerns and value. The entire operation radiates confidence in its ability to attract long-term, high-value customers. Though the shop doesn’t position itself at the very top of the market, their ideal customer is in the top third, and they pull out all the stops to make that customer feel at home. The Courtesy customer appreciates the communication, problem-solving and quality and is willing to pay a fair price to have their needs met. If that means that bargain shoppers have to look elsewhere, Scott doesn’t seem particularly phased by that. Stand outside the store and there’s another differentiator that signals to the world that the store knows exactly who they want to be associated with. It’s all in black and white. Or, rather, in blue and gold. 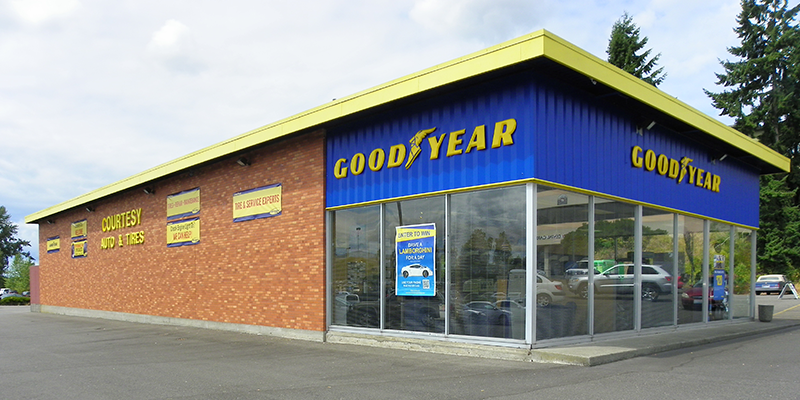 Courtesy is a branded Goodyear outlet and a very large portion of the store’s sales are Goodyear tires. But that relationship goes well beyond a decision to sell a certain tiremakers’ product. Courtesy does more than put tires on cars – it revels in the brand. If you know Scott, the relationship with Goodyear should come as no surprise. He has a long and interesting history with the iconic tiremaker. He cut his teeth in the industry in his early twenties by working in a Goodyear corporate retail store. Even after he, as he diplomatically puts it, “didn’t dodge the reorganization bullet,” he never strayed all that far from the tiremaker, coming back to the company a second time before moving to the other side of the relationship. Over the course of about 15 years and across two stints, he worked in a variety of positions in the company, ranging from retail to marketing to wholesaling. It was this last job that would lead him down the road of owning his own business. That happened when Scott went to work for a customer of his, a man that had helped him throughout his career and taught him juch about the industry. For a few years, Scott worked for the dealer, learning what worked and what didn’t. Soon he had the confidence and resources to move onto the ownership side. He decided to go into business with his boss, and after a year of joint-ownership, Scott and his wife, Susan, bought out their partner and became the full owners of Courtesy. In the years since, Scott’s time working in marketing has served the business well. In addition to the shop’s confident positioning in the market, he has embraced all kinds of technology in order to get the good word out to the community in Tacoma. That embrace of technology has become part of the operations and image of the company. They offer digital inspections and use email and text-based services for customers who don’t want to talk by phone. They operate a full suite of social media platforms and have executed marketing campaigns in the traditional and digital sphere. The shop uses tablets to provide pictures, video and data to show directly to the customers, creating a level of trust that, yes, this is really the part that you need. 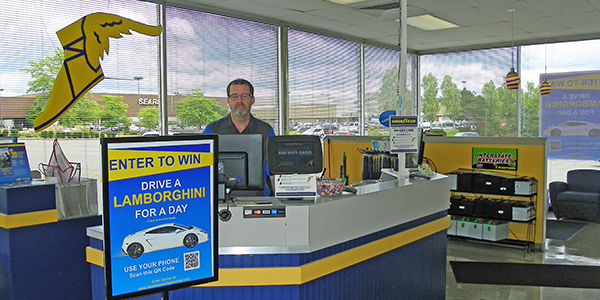 Unique to their area, Courtesy has an associated rental car company that serves as a secondary profit source and also functions as a way to provide customers a temporary vehicle for $10 per day while their car is in the shop. “I’ve got two key guys, Bob and Doug, they both live, eat and breathe problem solving, listening and making sure that the customer knows that we appreciate they’re here and that we’re here to help them,” Scott says. Scott recounted a recent example of a potential customer that called into the shop to ask about what she needed to do to comply with Washington’s emission guidelines, which he says can be difficult for consumers to understand. Even when he’s out of the shop, he’s confident that the team is going to make it happen. The flip side of that relationship is the importance of making sure that the employees feel just as welcome as the customers do. Not only does the shop provide, training, good compensation and advancement opportunities, but they are closed on weekends. That doesn’t just go for the boss or the key staff, it’s everyone. On Saturday, Sunday, and major holidays, the shop is closed so employees can be at home with their families. While that might sound like just a good deed, the practice has created a number of indirect benefits for the store. Customers see that employees’ family time is respected, and that has become a differentiator in a business where it’s easy to get lost in the pack. It has also helped with recruiting and retention. In turn, the high-quality and motivated workforce are able to deliver an even better experience for the customer. Since implementing the policy, a number of the shop’s profitability metrics have gone up. 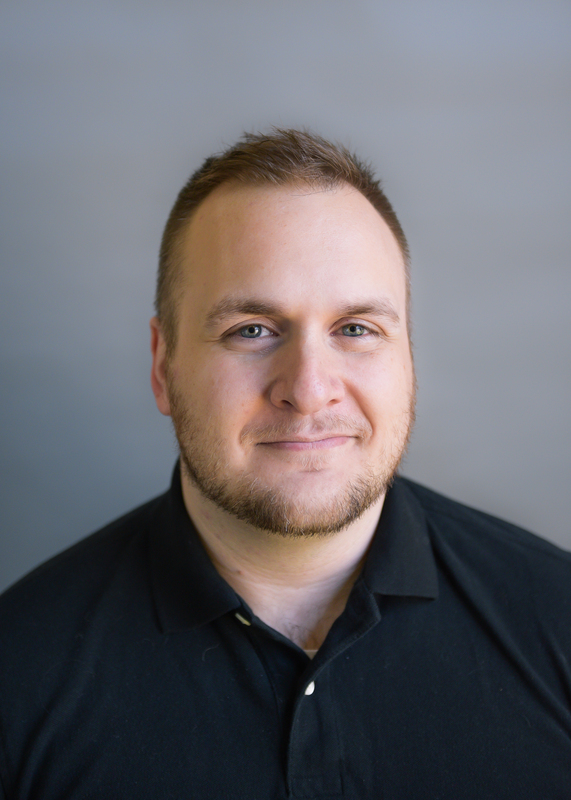 Even with so many strengths, Scott understands that the real key to success is in showing up every day and putting in the hard work to make customers feel good about the products and services they are shelling out their hard-earned money to buy. There is no easy path to success in this business. Even for a two-time Top Shop finalist, the fact that customers keep coming back is the highest praise that they can earn. Take a look at Tire Review’s October 2018 Digital Edition.